I am in the process of covering my recent trip to LEGOLAND Billund (and e.g. Miniland). One of the major attractions of Legoland is the LEGO Shop next to the main entrance. I will return to that store in a coming post, but let’s take a breather and a quick look at a keyring I bought as a souvenir. Regular readers may remember my old 1980s keyrings (LEGO Ambassador and Castle) from the very same Legoland and the recent 1958 inspired keyring that came from Japan – so naturally I was inclined to buy one this time as well. The selection of keyrings at Legoland was huge, both in the LEGO Shop and e.g. in the new Polar Land store. Since this whole blog and experience is (still) a bit of a nostalgy trip for me, my eyes naturally gravitated towards something classic. Amongst all the cool 2×4 brick and Star Wars keyrings, the words “…in space since 1978” caught my eye. And there it was, the orbiting logo of what later became known as “Classic Space” in the LEGO universe. 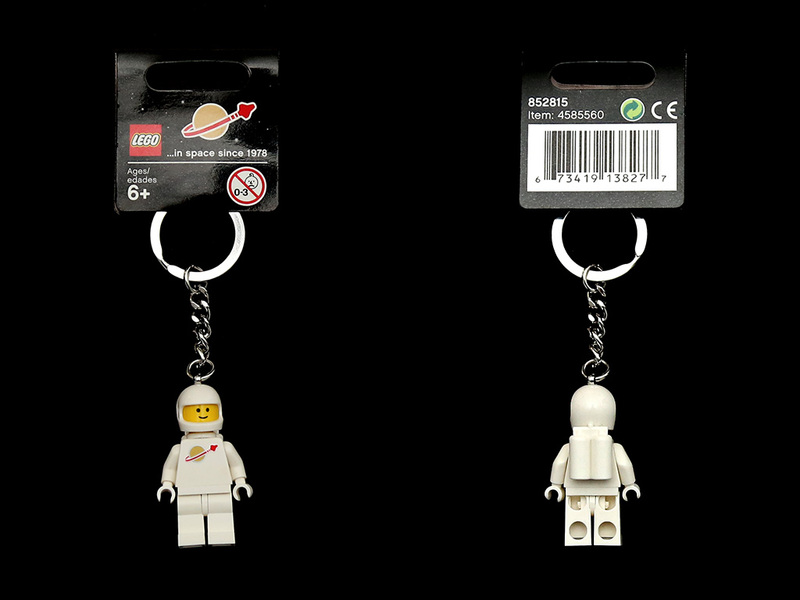 And beneath the label, hanging a classic LEGO Space astronaut, in full white and with the simple facial expression all LEGO minifigures shared between 1978 and 1989. From neck down everything was just as I remembered, although the torso print is obviously new and looks ever so slightly different than the original – but it is close enough. What almost made me not buy this keyring was the helmet. It was obvious immediately: I had seen that white glossy helmet before – not in any of my old LEGO Space sets, which featured different and non-glossy helmets, but in my son’s LEGO collection, the helicopter pilot in 4440 Forest Police Station for example has one. This is the Minifig, Headgear Helmet Standard from 1987 onwards, when Classic Space was discontinued and replaced by Futuron and Blacktron (see my 1989 catalog post for a picture of Futuron/Blacktron). The LEGO Group apparently got a bit lazy (and cheap) on this one, not bothering to produce the correct classic part for the keyring. The keyring can’t depict a Futuron/Blacktron figure either, because their torso prints and colors were completely different. Other than that minor detail, the keyring is a nice memento. The keyring is labelled 852815, with the item number 4585560. 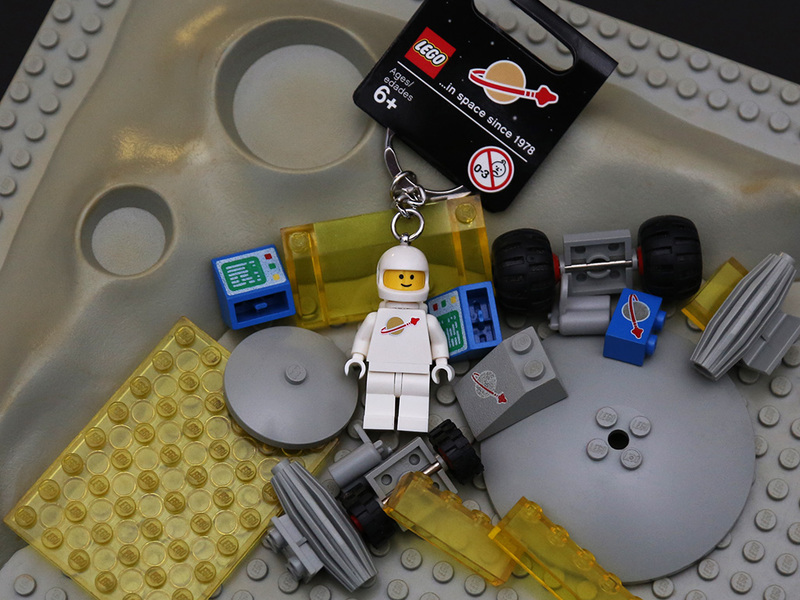 Brickipedia calls it the 852815 Classic Spaceman Keychain. I will take a closer look at the helmet differences in a future post.